Nashville's favorite wacky art festival will take place August 11th and 12th, 2016 in East Nashville's historic Five Points. "A Uniter, Not a Divider ...Bringing Together Fruits & Vegetables!" (NASHVILLE, TENN) June 29, 2017 — Nashville’s favorite wacky art festival returns for its 14th consecutive year on Friday, August 11th and Saturday, August 12th, 2017 in East Nashville’s historic Five Points. This FREE, costume-encouraged event provides a wildly entertaining, fun-filled day for all types and all-ages. A community builder, Tomato Art Fest has steadily drawn larger crowds with each passing year. Last year, an estimated 55,000 came to celebrate this beloved fruit / vegetable and enjoy the day’s memorable festivities such as the array of wacky & hilarious contests, the popular second-line style Push, Pull & Wear Parade with floats and costumes kicking off Saturday’s festival, a TURBO Nashville tactical urbanism installation, and a few new features to get excited about. Recently highlighted in National Geographic Travel‘s international list of Best Summer Trips of 2017, and Southwest Magazine‘s 93 Days of Summer, the festival’s 14th year will offer an improved VIT Area (“Very Important Tomato”) with perks and refuge from the August sun, a new Cooking Stage with tomato-themed culinary experiences with local East Nashville restaurants/chefs. The favorite Bloody Mary competition has graduated to a Bloody Mary Stage, and The Woodland Stage presented by Basement East is also new this year, totaling six stages at this year’s event. This year the festival is excited to be boldly reaching to accomplish a World Record attempt for the “Largest gathering of people dressed as Fruit/Vegetables” on August 11th at the Friday Concert. The Friday night portion of the festival will take place August 11th from 6:00 pm to 11:00 pm and offers free live music, favorite local food trucks, and a cash bar. The Saturday portion of the festival will take place Saturday August 12th and will include the parade, live music from 10:00 am – 9:00 pm, food trucks, a unique Vendor Marketplace from 9:00 am – 6:00 pm, Contests, Kids Activities, and much more. Touted in the Oxford American, and Southern Living as “One of the 5 things you need to know in the South right now”, Tomato Art Fest was also voted “Best Festival” in the 2007, 2008, 2009, 2010, 2011, 2012, 2013, 2014, 2015, and 2016 Nashville Scene Reader’s Polls. The festival and official kickoff events are free to attend and wide open to the public, uniting the community for an evening of inspired art, wacky activities, great local music, creative vendors, unique kids activities, favorite food trucks, and a commitment to ensuring that the fest is green in every possible aspect, and maintains local East Nashville traditions. A percentage of proceeds benefit Friends Of Shelby Park. Tomato Art Fest was founded by Meg and Bret MacFadyen, owners of East Nashville’s Art and Invention Gallery. In 2004, the gallery hosted an art show celebrating the tomato in late summer, and planned a few neighborhood events to promote the show. Tomato Art Fest proved so popular that it immediately turned into an annual, signature event for the hip, urban neighborhood of East Nashville. Be a Very Important Tomato (V.I.T.) at this years Festival and enjoy the event from the V.I.T. lounge. Ticket includes snacks, drinks, private restrooms, private bar, and mostly important shade so you don’t turn into a tomato. The V.I.T area will be open Friday 6 pm-11 pm and Saturday from 9 am-6 pm. Tickets are $75.00 for adults and $25 for kids 5 and under are able to access the tent. It all began by paying homage to the versatile fruit / vegetable known as the tomato through locally curated tomato art. 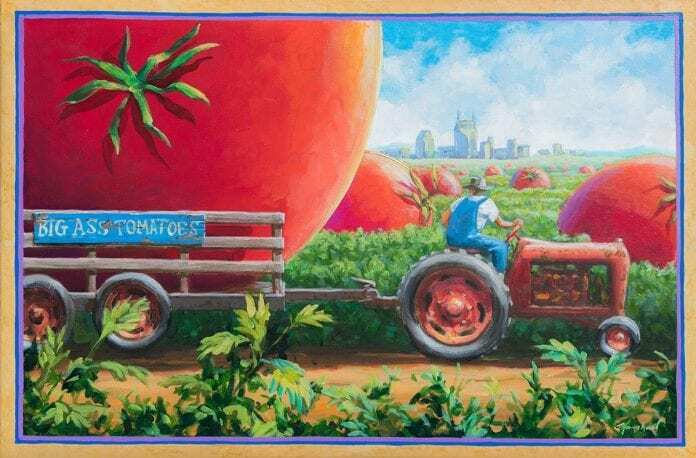 True to the event’s namesake, the art gets a big part of the tomato spotlight, where Art & Invention Gallery showcases over 300 tomato-inspired pieces throughout the weekend. Giant Ice Cream Sundae Extravaganza! * Additional contests and activities are in the confirmation process and will be added to tomatoartfest.com and social media as they are confirmed. The Tomato Art Fest Friday Concert on Friday August 11th includes performers such as FUTUREBIRDS, Becca Mancari, and Waterfall Wash on the 37206 STAGE Presented by XFINITY. Saturday August 12th’s 37206 STAGE Presented by XFINITY will include such acts as Smooth Hound Smith, Skyway Man, Okey Dokey, Morgan Bosman, Josie Dunn, Parker Gispert of The Whigs, Jess Nolan, Fanny’s House of Music presents Queens of Noise (Teen Runaways Tribute Band), Nashville Academy of Rock, YEAH! Southern Girls Rock Camp, and Halfbrass kicking off the day’s live music. The WOODLAND STAGE Presented by Basement East, will include such acts as Daddy Issues, Electric Tuba, Caleb Groh, Them Vibes, John Latham, Cali Rodi, and others. The COLD LUNCH RECORDINGS STAGE will feature perfomers Ian Ferguson, Microwave Mountain, Big Surr, Lean, The Inscape, The Burps, Telefones, and Jacob Disedare. The MUDDY ROOTS STAGE will return this year with an eclectic lineup of Americana and Rock artists that is always a highlight for festival-goers. The COOKING STAGE and CONTEST STAGE details and schedule of events will be added to tomatoartfest.com and social media within the coming weeks. SPONSORS: We have the following sponsors to thank this year for helping us reach 14 years of Tomato Art Fest! MEDIA KIT ASSETS: Please find a Media Kit in our Dropbox for your use. For more information, please visit tomatoartfest.com.